The track buckling happens in hot weather because of a multitude of factors but it is massively influenced by the track longitudinal and lateral resistances. – between rail and fastening – at this level all the modern fastenings are behaving very well if they obey to the limits established by the fastening design norms. The European Norm EN 13481 (Performance requirements for fastening systems) is generally used in Europe and assimilated around the world due to the Europe-based main fastening providers – Vossloh and Pandrol. For modern fastening systems the bucking will never happen at this level; the rail will not unclamp from fastenings and buckle. For old fastening systems – the ones that were using spikes or crampons to fix the rail in place – a proper clamping force is not constantly provided and in this case the buckling might happen at this level, firstly as a vertical buckle wave that will free the rails from fastenings, followed usually by a lateral buckle. So using modern fastening is a method to prevent and avoid buckling. – between fastening and sleeper – here we encounter the highest resistance. For Pandrol fastenings for example, the clip shoulder is embedded in the sleeper’s concrete so no relative movement of any kind will happen at this level. The alternative, screwed fastening, is similarly good and all modern screwed fastenings are designed to have a very high lateral resistance at this level. The use of modern fastenings is providing proper lateral resistance between fastening and sleeper; this is preventing the buckling. between (rail+fastening+) sleeper and ballast – here the lateral and longitudinal resistances are the lowest and the most difficult to control. The bucking always happens at this level, for modern track superstructure. 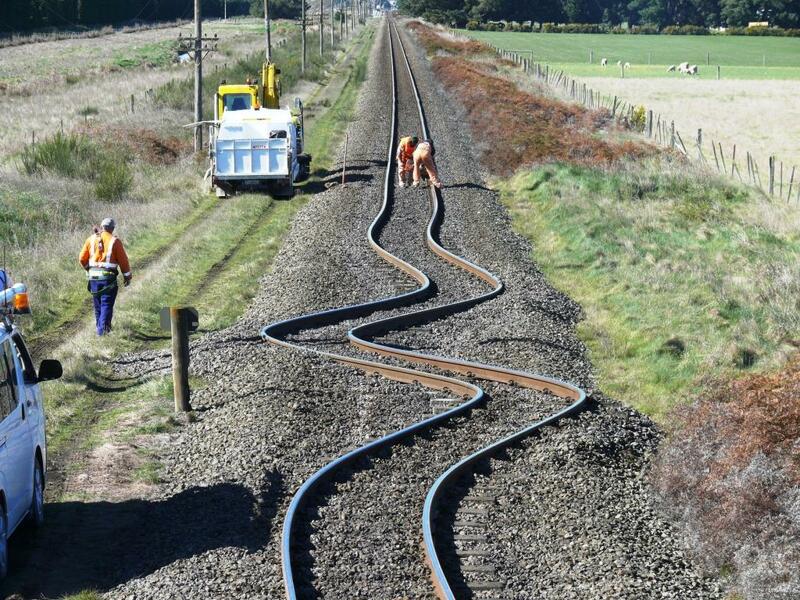 Track buckling in New Zeeland due to an earthquake (September 2010). Image source. Once the lateral resistance at this level has been overcome, the rails/sleepers frame moves thorough the ballast, looking for the post-buckle equilibrium state. Most of the methods to mitigate the buckling risk are focused on increasing the resistance at this level. For the ones above the solution is simple and easier to manage and control. use of lateral resistance plates (in the buckling test from the beginning of this post the lateral resistance plates – installed at the middle of the sleeper – are staying in place even after the buckling). slab track – buckle this if you can! heavier rail – able to take increased axial stress. Hmmm, what about different rail shape, one with a bigger lateral inertial momentum … Not very efficient compared with the other methods above. well installed and maintained tracks without alignment defects that could trigger the buckling. good formation – with low variation between loaded and unloaded track to avoid buckling under trains. Around the world it is used in the formation design/maintenance the deformation modulus Ev2 as a measuring feature indicating the general stiffness of the formation. if the annual temperature variation is very high, just install the rails at higher temperature to reduce the variation from neutral temperature to the maximum. In Russia this method is used – so called “summer rails” and “winter rails”. Before summer, increase the track neutral temperature by reinstalling the track and in autumn, cut them and reinstall again at lower rail neutral temperature, to prepare them for the heavy winter. This option is considered when the temperature span between winter and summer is high and unmanageable with a single annual stress free temperature. paint them white … 3 to 7°C reduction in rail temperature sometimes helps ( a very interesting article about this you can find here: http://tinyurl.com/pfgajsw ). ← Cant and Cant Deficiency. Where is the 11.82 coming from?